Jennifer Heim is the amazing talent behind Jemma Sands jewelry. 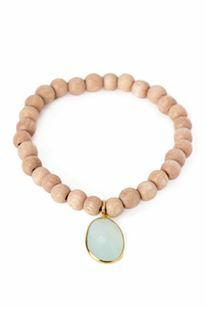 Based in California, this exquisite jewelry line is founded on the love of water and all natural elements of the earth. Jennifer is a self-proclaimed bikini fashionista, known as a water baby and lover of the beach life, she creates beautifully adorned jewels for bikini lovers alike. The designer uses gemstones such as tourmaline, labradorite, moonstone, turquoise only to name a few. She also works with raw diamonds, sapphires, topaz and other types of rare gemstones. The Bikini Fashionista team absolutely loves Jemma Sands, our BF intern, Amber, received her newly coveted Maldives Beaded bracelet in the mail and she absolutely loves it. This accessory has a rustic elegance to it, adding character to a casual outfit with a dash of glam with the gem stone accents, this a trio bracelet that every bikini fashionista should have, only retailing at 48$, it's a perfect holiday gift! We can't help to show you our other Jemma Sands faves, gear up for the holidays and shop their online boutique! Join Jemma Sands on Facebook! I love these. Those wooden beads are great and I love the open bracelets! Hmmm, California, I wonder if they ship to Canada? Aren't they beautiful?! Yes they do ship to Canada! Make sure to check out their website and shop their goodies. Thanks Caroline.